J.L. Turner Sr. was born in 1869 in Dallas County where he was reared on a farm. Following high school graduation, Turner left Dallas County to attend Wiley College in the East Texas city of Marshall. He then moved to Chicago where he received his LL.B. 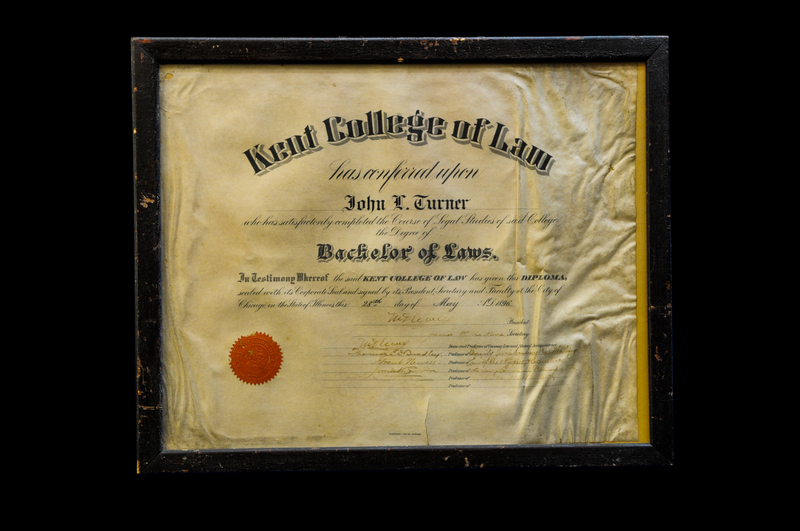 degree in 1896 from the Kent College of Law, which today is IIT Chicago-Kent College of Law. 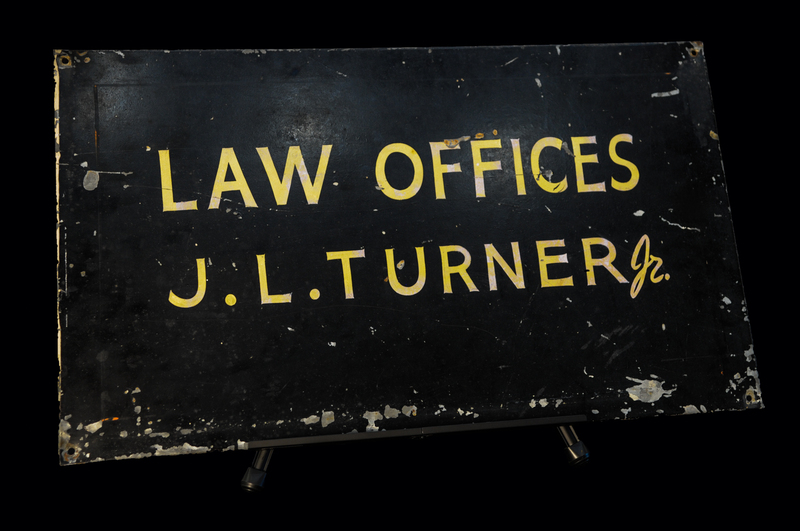 In 1898 Turner returned to Dallas and practiced law downtown at 155 Main Street with Joseph E. Wiley, probably Dallas’s second African-American attorney. 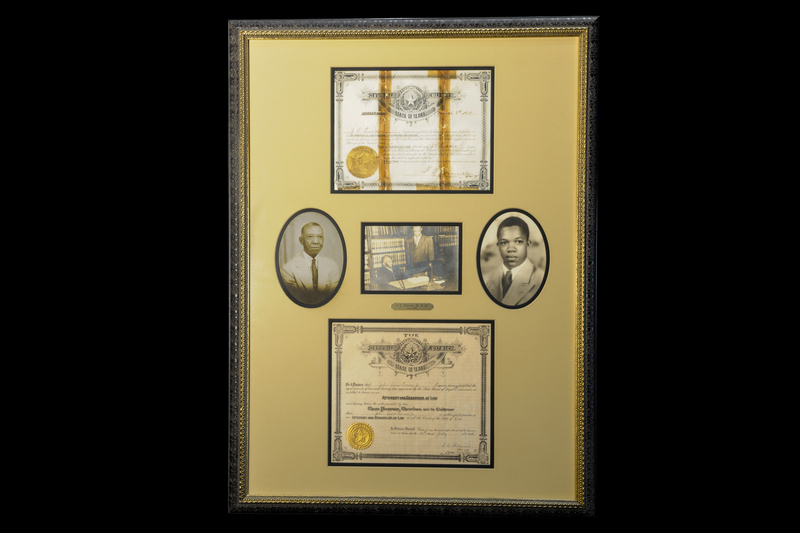 Turner himself was only the third or fourth African-American attorney ever to practice in Dallas, and he maintained his practice until his death in 1951. Turner was very much a pioneer. By 1890, there were only twelve African-American lawyers in the entire state of Texas, and, as late as 1930, there were only twenty. Having a law degree made Turner exceptional, particularly in the early years of his career. For most of the nineteenth century, candidates for admission to the bar usually lacked a formal legal education, having instead “read the law” under the tutelage of one or more older attorneys. Texas did not have a bar exam until 1903. 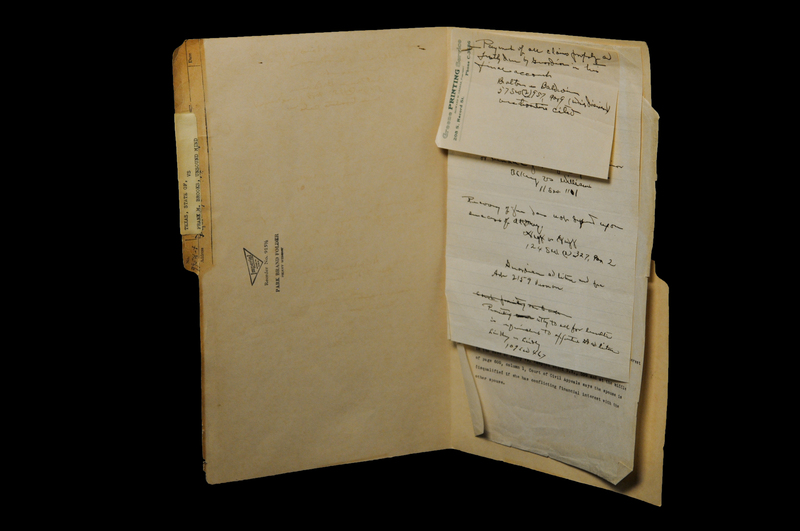 In 2016, George Keaton Jr., a Turner descendant, donated to SMU's Underwood Law Library much of his family's archive of Turner materials. The archive is the source of most items in this exhibit. Many documents from the archive are available at https://www.smu.edu/libraries/digitalcollections/jlt. Reference: John G. Browning & Carolyn Wright, We Stood on Their Shoulders: The First African American Attorneys in Texas, 59 How. L.J. 55 (2015). This hand-painted sign bears the suffix “Jr.,” which appears to be a later addition for J.L. Turner Sr.’s son, who also practiced law in Dallas. Probably the father, and later the son, used the same sign. 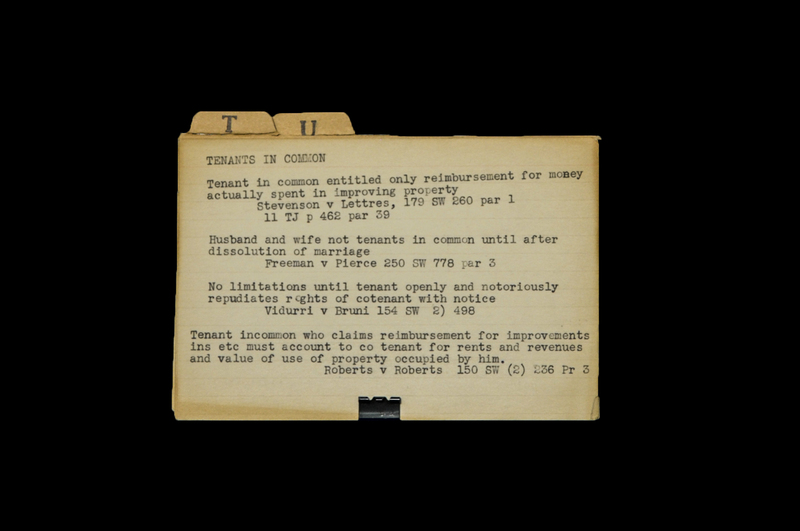 Turner kept an index card file for legal research, with each card summarizing points of law such as “Tenants In Common” and “Adverse Possession.” The index card file provides insight into some of the legal issues Turner frequently addressed in his law practice. 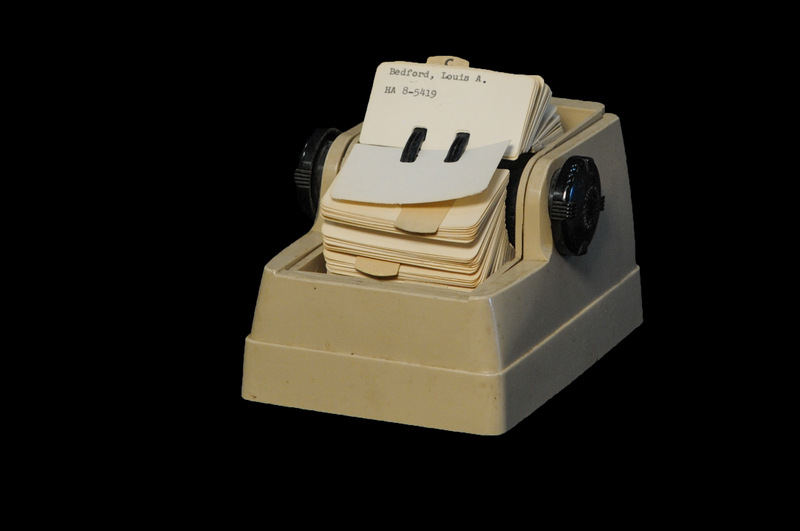 Turner’s Rolodex provides interesting insights into an active Dallas law practice that spanned from the late 19th century to the mid-20th century. The photograph in the center of this framed montage depicts J.L. Turner Sr. and son J.L. Turner Jr. in the law offices they shared at 1723 Routh Street. The Texas law license certificates of J.L. Turner Sr. and son, as well as their individual photos, also are shown. J.L. Turner Sr. received his Bachelor of Laws (LL.B.) degree from the Kent College of Law in Chicago in May 1896. 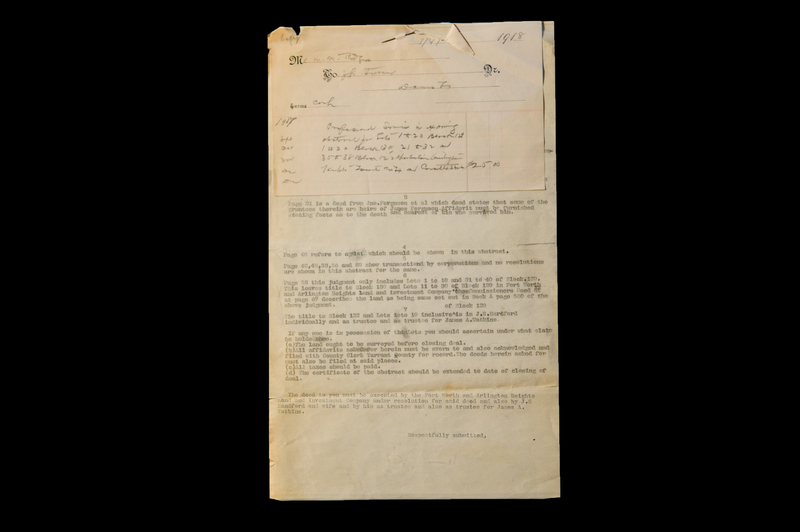 This land title search report from October 8, 1913 is an example of the work product of J.L. Turner Sr. in the area of real estate law. 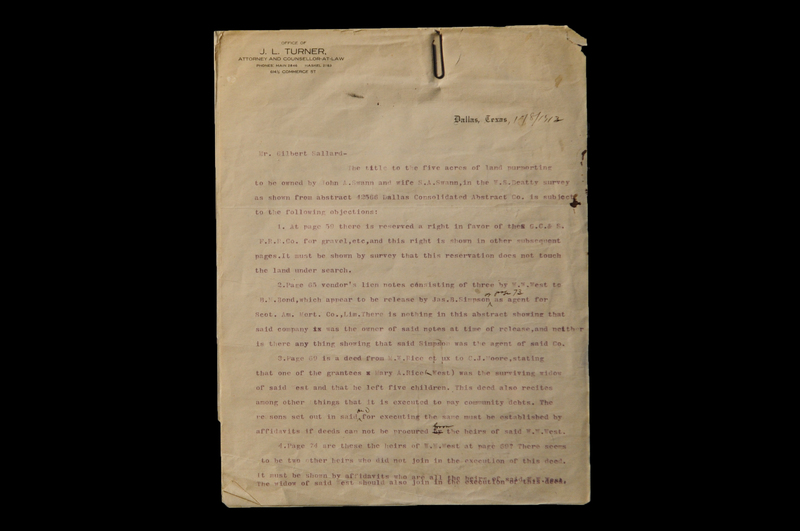 In addition to such title reports, Mr. Turner’s archived files include many briefs filed in civil litigation, among other legal matters which he handled in his law practice. This handwritten bill dated January 4, 1918 requests the payment of $25.00 for ‘Professional Services in examining abstracts for Lots 1 to 20…’ $25.00 in 1918 corresponds to approximately $400.00 in 2016 dollars. 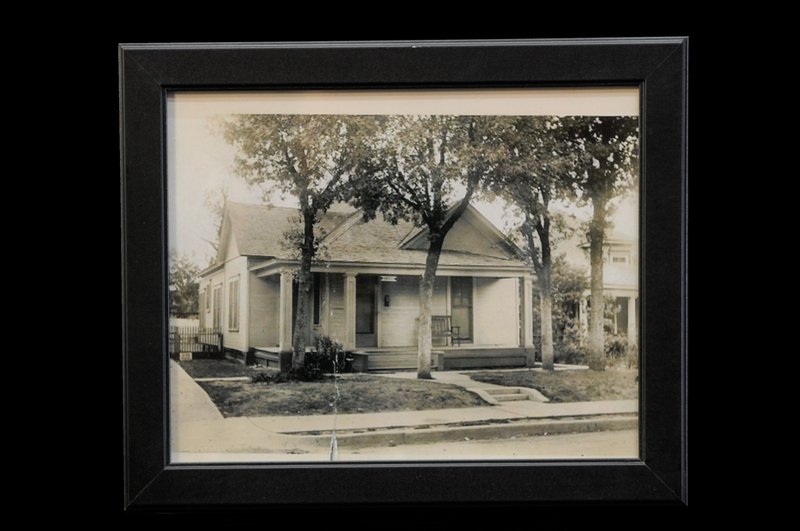 This circa 1925 photograph depicts Turner’s house at 1821 Allen Street in what is now the Uptown neighborhood of Dallas. Today the location is the intersection of Allen Street and Woodall Rodgers Freeway. Founded in 1952, the J.L. 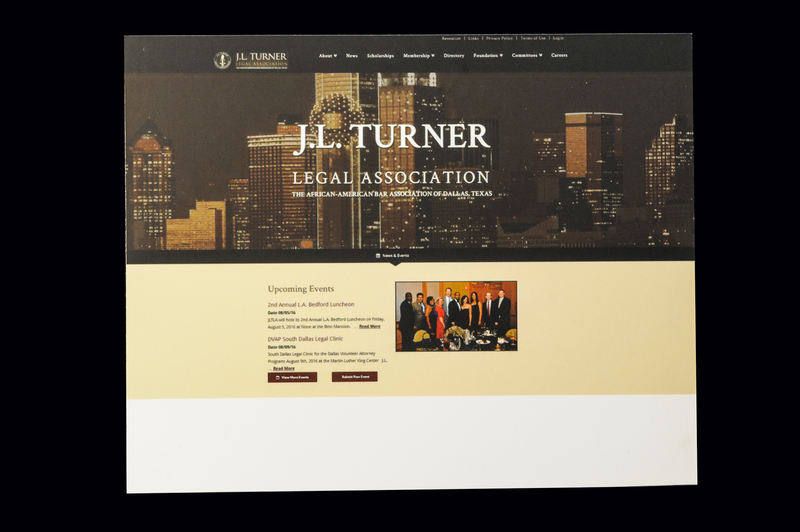 Turner Legal Association is the bar association of Dallas’s African-American legal community. The Association’s mission is “to improve the quality of life in our community through education, service and scholarship.” Among other outreach activities, members of the Association provide scholarships to law students demonstrating financial or other needs. Dr. Darwin Payne, SMU Professor emeritus and prolific author on Texas history, wrote this 1999 book on the history of Dallas’s legal profession. Payne discussed J.L. Turner Sr.’s important place in that history. 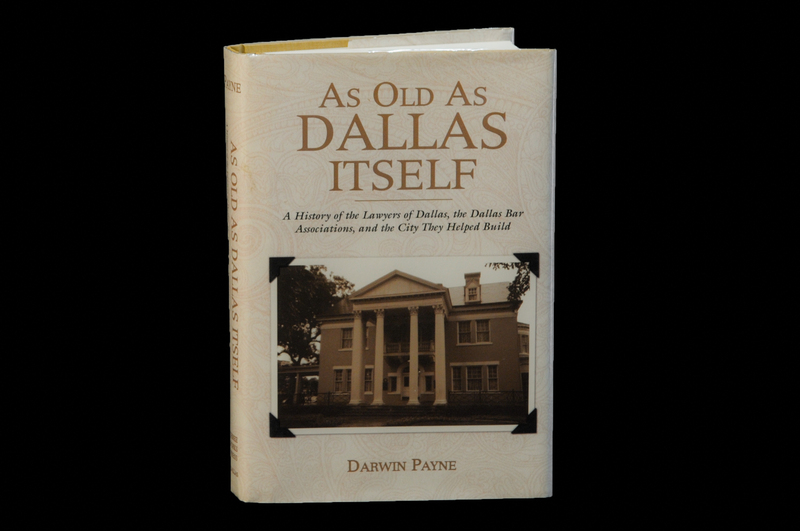 Darwin Payne, As Old As Dallas Itself: A History of the Lawyers of Dallas, the Dallas Bar Associations, and the City They Helped Build (1999). 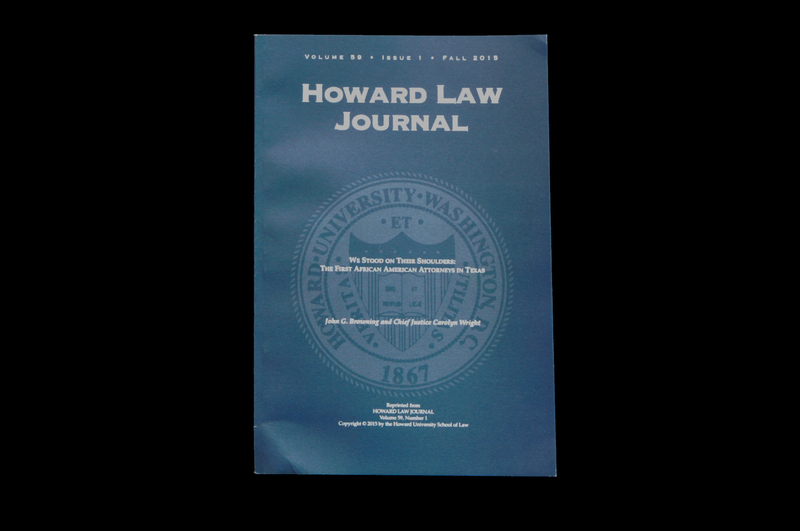 SMU Adjunct Law Professor John G. Browning recently co-authored with Chief Justice Carolyn Wright a Howard Law Journal article on the history of African-American attorneys in Texas. In this article, Browning and Wright explained that J.L. 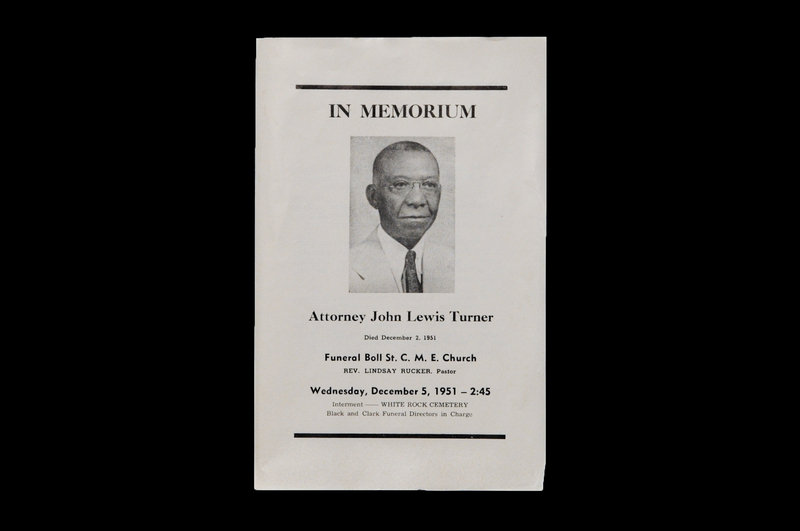 Turner Sr. maintained a law practice in Dallas for over five decades and mentored several of the most prominent African-American attorneys in the history of the city. John G. Browning & Carolyn Wright, We Stood on Their Shoulders: The First African American Attorneys in Texas, 59 How. L.J. 55 (2015). In 1992, the Dallas Morning News recognized the growing influence of the J.L. Turner Legal Association. This article discussed how the TURNER ASSOCIATION was continuing to address issues that particularly affect the African-American and minority community in this area. 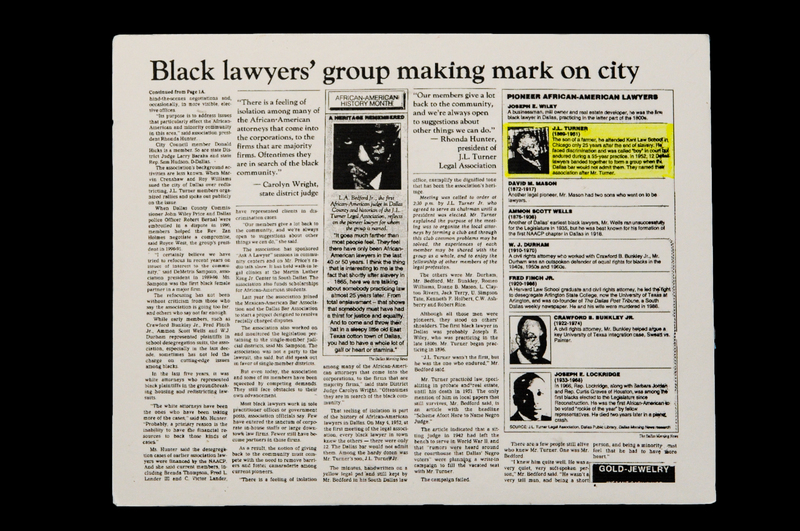 For example, in 1991 the TURNER ASSOCIATION joined with the Mexican-American Bar Association and the Dallas Bar Association to start a project designed to resolve racially-charged disputes. 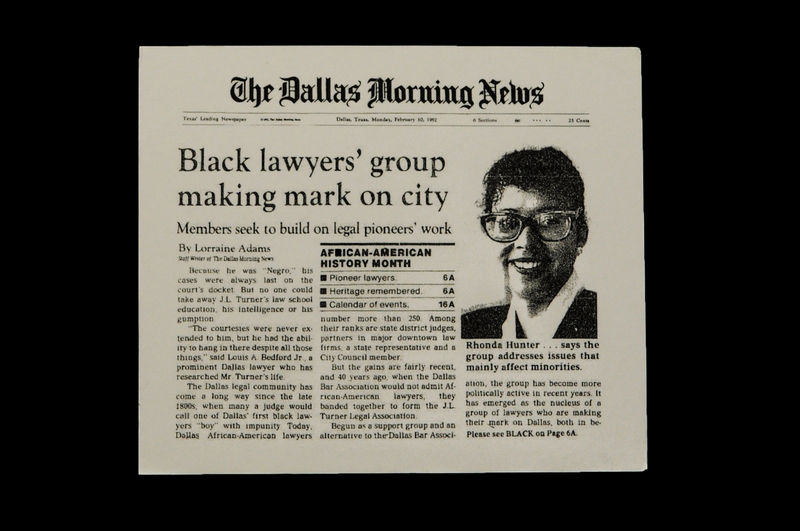 Lorraine Adams, Black Lawyers' Group Making Mark on City, Dallas Morning News, Feb. 10, 1992, at 1A. A 2016 Dallas Observer article described J.L. Turner Sr.’s pioneering role. 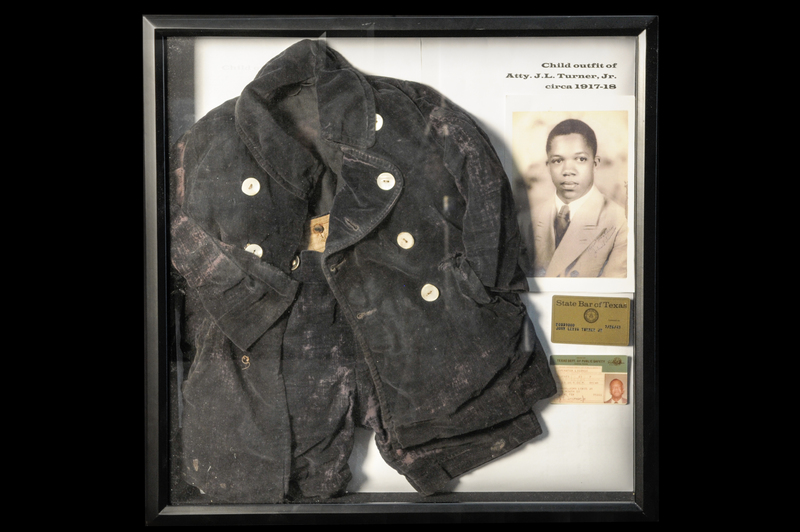 This article highlighted an event in 1921 in which Mr. Turner helped exonerate two African-American children wrongly accused of perpetrating a fire alarm hoax that led to the death of a fire department captain. Joe Pappalardo, The Trailblazing Life of J.L. 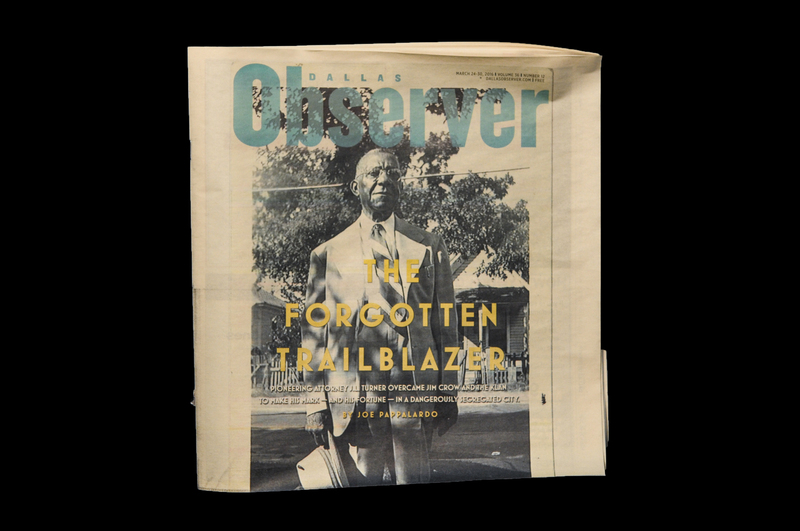 Turner Sr., One of Texas' First Black Attorneys, Dallas Observer, Mar. 24, 2016, at 1. Funeral program of J.L. Turner Sr. held December 5, 1951. J.L. 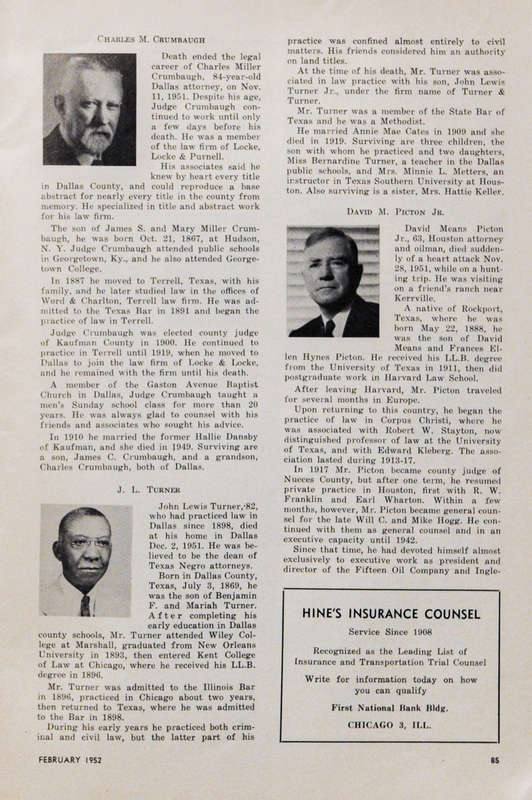 Turner Sr. was memorialized in the February 1952 issue of the Texas Bar Journal. 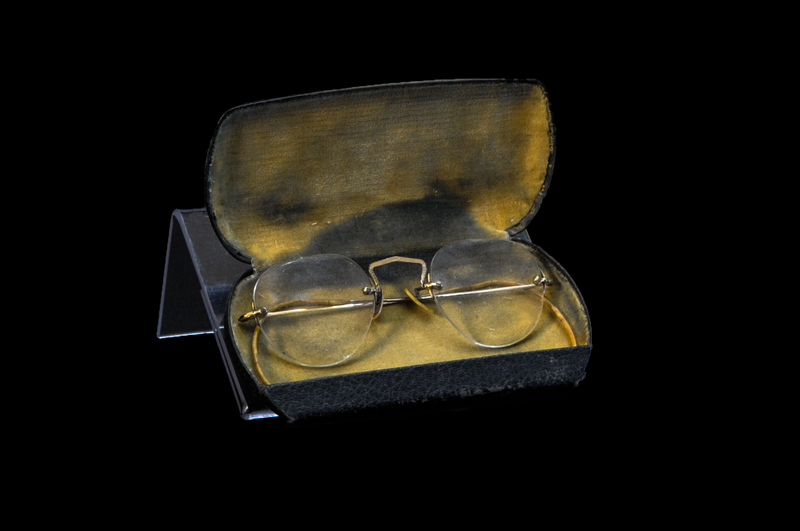 The memorial notes: “During his early years he practiced both criminal and civil law, but the latter part of his practice was confined almost entirely to civil matters. His friends considered him an authority on land titles.” Tuner’s funeral program is also shown here.